Shadow Squadron is a first-person space shooter that was released as Stellar Assault in Europe and Japan. You play as a Flight Officer and your job is to protect Outpost 51 from an invading alien fleet. There's six missions, along with two selectable ships that have unique abilities. Feather 1 has auto laser guns, guided laser torpedoes and recharges its energy after each mission; in contrast, Feather 2 has heavy lasers, an energy torpedo and a stronger shield, but never recharges its energy. 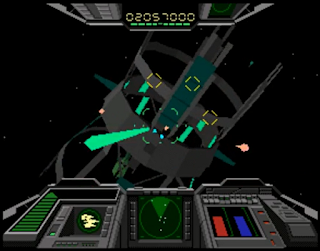 The gameplay involves flying around, using your radar to locate enemies and then destroying them. While the first four missions are repetitive they're incredibly enjoyable, and I love how much strategy is involved in terms of discovering the weak point of each enemy ship. The controls are fantastic and allow for split-second avade manoeuvres, while the constrasting styles of the two playable ships offer lots of replayability. Mission 5 includes an awesome Trench Run scene, and the pologon-heavy graphics look great while showing off the power of the 32X's processing speed. Mission 6 introduces a timer where the objective is to destroy the eight slave units before blowing up a G.L. Cannon; the time limit is short (it's almost impossible to complete the mission on your first try) but it's a neat diversion and works well as a final boss battle. Despite how much fun the action is though, it's over quickly and feels slightly unfinished; it's almost as if the developers were told to stop creating assets and just use the existing ones so the game could be rushed to release! There is an additional on-rails shooter mode, but it gets unwieldy by Mission 4 due to the unrelenting projectiles and the fact that the cursor speeds are either too fast or too slow. 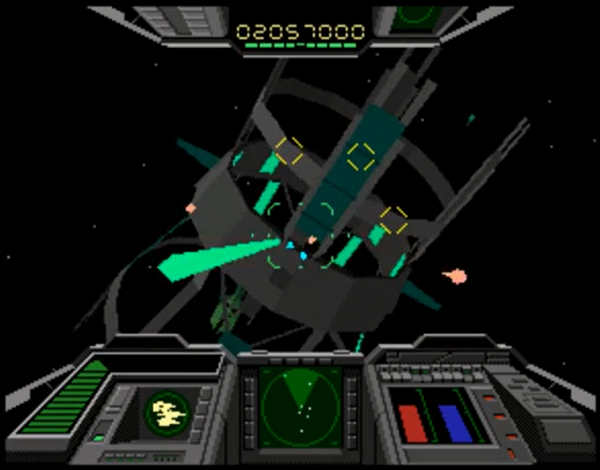 Shadow Squadron is a competent space shooter, with fun missions and gameplay that demolishes Star Wars Arcade (1994, Sega 32X) in just about every way. There's no escaping that it's light on content and mission variety, but its deceptively deep mechanics and variance in the playable ships are good hooks to keep you coming back. Random trivia: In 1998, a sequel was released on the Sega Saturn called Stellar Assault SS.